The crew behind The Sixth Gun is back in its aftermath with another supernatural western that is every bit as exciting and engaging. Cullen Bunn and Brian Hurtt ride again with a hit series in waiting. The new ongoing arrives this June from Oni Press but Free Comic Book Day provided a prelude for your enjoyment. The world is thinnest at The Crossroads, a mythical plane that serves as a doorway throughout the universe. It is here that a band of adventurers throughout the Wild West gather, brought together by Gord Cantrell and Abigail Redmayne with a singular purpose: to fight back against the creatures that would endanger the sanctity of all creation. I'm always in the market for a good western comic. It's one of the genres that are kind of rare in comics these days, so on Free Comic Book Day, we were blessed with not just a western but a supernatural western from some talented creators. Bunn and Hurtt's The Sixth Gun was a rousing series in the same vein. 'Shadow Roads' is an extension of that universe and this is one riveting introduction. The story alternates between New Mexico and London introducing us to some interesting characters. It opens with a couple of university students taking an awkward tour of the British Museum of History. The guide, a white man, wearing a Native Indian headdress talking about "noble savages" seems clueless about how offensive he is while standing in front of the student with Native heritage. They continue to explore the Native exhibit on their own when a mysterious woman hands the student a dagger. Elsewhere, two cowboys ride across the desert into a dusty old town in New Mexico. The two go their separate ways when they arrive. Ghost Eyes as he's called is looking for a particular girl with special skills. They have a mutual enemy that needs to be served justice. Back in London, the two students ride a train that leads to some supernatural forces, a mysterious woman, and a new adventure. Bunn and Hurtt know how to draw a reader in and from the very scene to the last you can't help but anticipate what happens next. This issue immerses the reader through some excellent character work, the contrasting personalities of the students, the surprising journey of the two cowboys, all work to draw interest before there's one action scene. The action doesn't really begin until the end and by that point, you're invested in their adventure and want to see more. The cliffhanger does what it's supposed to do, raise your desire for the next issue. None of this is surprising since 'The Sixth Gun' was similarly intriguing and exciting. Bunn and Hurtt deliver once again. A.C. Zamudio and Carlos N. Zamudio create a sort of western-noir helping to elevate the mystery and tension of the story. A.C. draws some great characters with an eye for era-appropriate attire. Carlos' colors are dark but rich with texture adding to the malevolent tone that hangs in the air for the protagonists. This is as much a joy to see as it is to read. 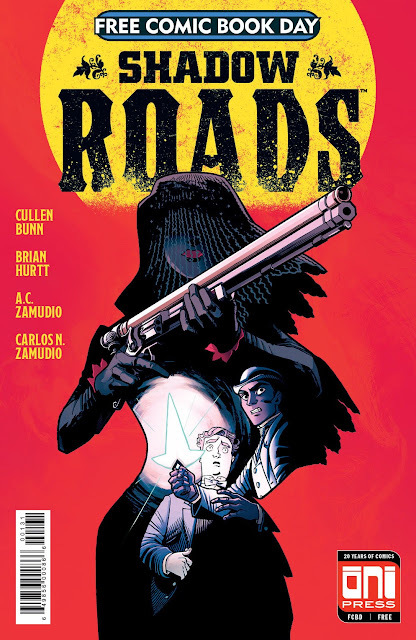 'Shadow Roads' is the next great supernatural western from Bunn and Hurtt with some great looking visuals from the Zamudios. Issue one does what great first issues do and that is to hook the reader with intriguing characters and extraordinary circumstances. Make sure to grab this Free Comic Book Day copy and put 'Shadow Roads' #1 on your pull list so you don't miss it this June.